Our most powerful repricing method is now even better. 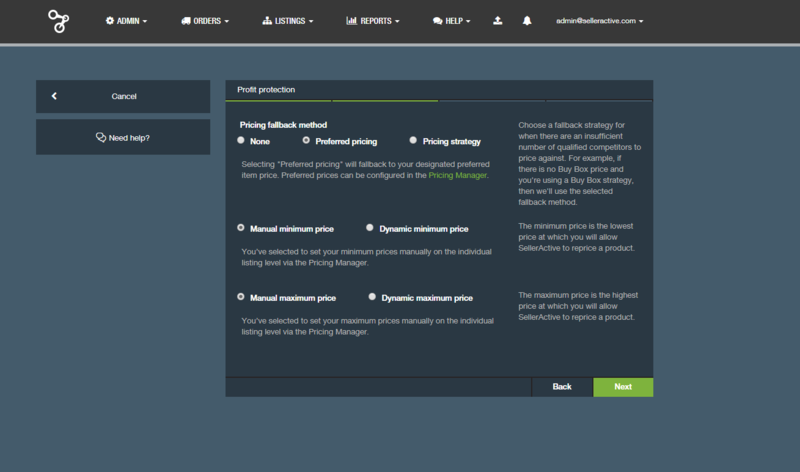 The newest version of our Algorithmic Buy Box Repricer (V3.0) now boasts some new features to help sellers not only capture more Buy Boxes, but also maximize margins while better protecting their profits. Our algorithm now allows sellers to better optimize how the algorithm behaves based on the optimal pricing strategies for their unique business. Fallback Pricing Strategy - When certain conditions are met, set a conditional repricing method to take over and keep your prices competitive. Risk Tolerance + Precision Control - Take better control over the range of price adjustments as well as the speed in which your products are repriced, allowing for greater consideration of the volume and attributes of your competition. Dynamic Min and Max Price - This new feature allows you to automate the minimum and maximum of your listing prices by using values such as Cost, Cost + Fees, Map Price, Retail Price with +/- a $ or % amount. Request a live demo today to see these new features in action.